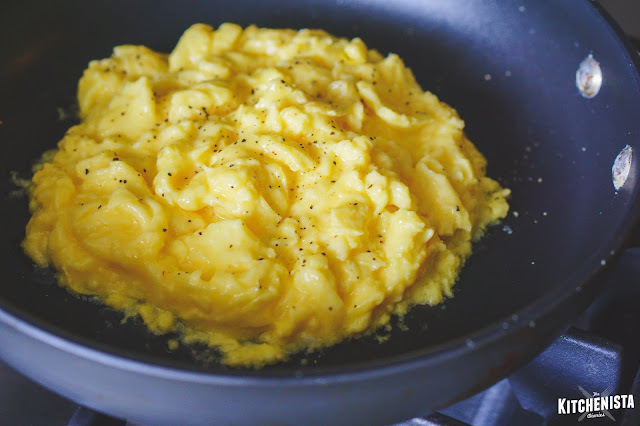 This is an update to the scrambled eggs recipe posted to my blog back in 2014. Scrambled eggs are still a staple in this house and one of Raven's frequent requests when she's home for breakfast. For those of y'all who know her personality, when she's ready to eat something, she needed it yesterday! For this reason, I skip all the extra ingredients nowadays. During times that I gave up dairy I really didn't miss the cream in my eggs, so I save that for special occasions only. Besides, you get plenty of (necessary) fat from the butter. My technique is essentially the same, just without cream, cheese, or herbs added. This is ridiculously easy and doesn't require any kind of prep or measuring. 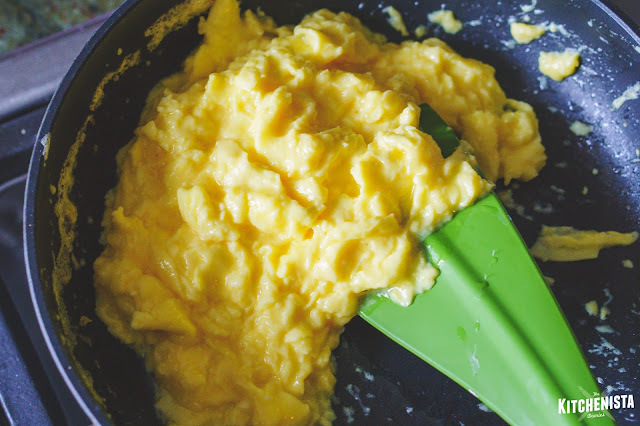 Don't overwork your eggs when whisking, you're just looking for them to be blended without streaks left. Wait until they're cooked to season with salt. Use the best quality eggs and butter that you can, since that's all you'll be tasting. It's worth seeking out farm fresh eggs and European style butter if you'd really like to impress somebody for breakfast! 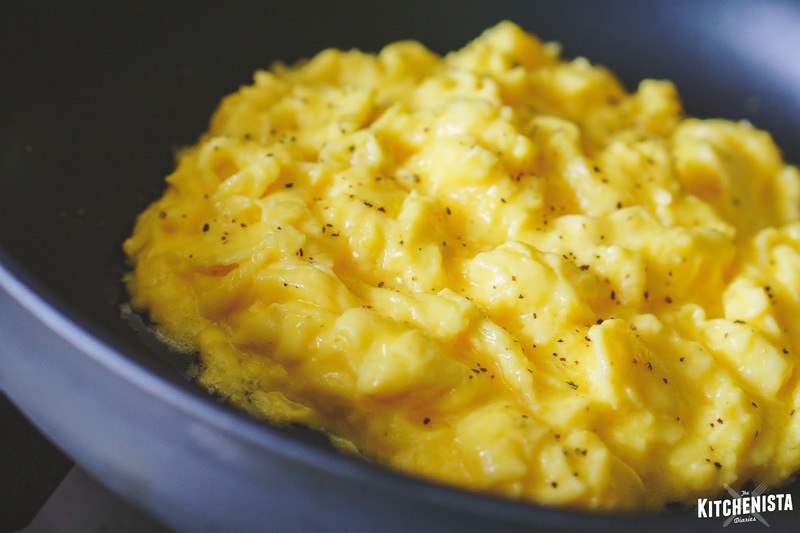 Scrambled eggs need lots of fat. There's no getting around that. If you can't have butter, most other healthy fats will do. Coconut oil or duck fat are great options. Avocado oil and olive oil also work, preferably a milder flavor that won't overpower the eggs. Control your heat, and be especially mindful when using an electric stove top versus gas. I'll explain more about that below. Use a good quality nonstick skillet, one that won't get scraped up or chip over time. I'm a fan of Calphalon's ceramic pans or any of their nonstick hard-anodized pans (affiliate links.) An 8" skillet will work for up to about 8 eggs, or move up to a 10" skillet for larger family sized portions. 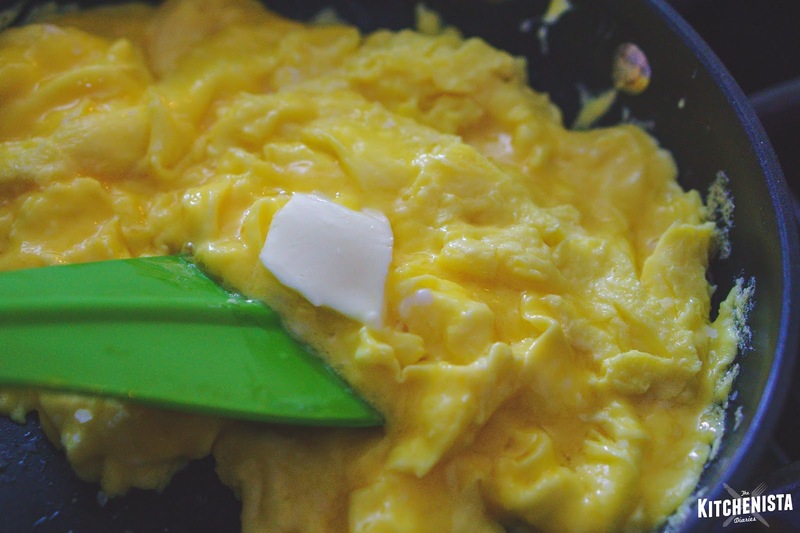 A silicone spatula is the easiest tool to use for cooking the eggs, because it's flexible, non-stick, and will hug the sides of the skillet. To see this recipe in action, check out my latest video on IGTV! I'm trying to work on doing more food videos! Shooting and editing videos is a completely different beast but I'm getting the hang of it. Please let me know your thoughts on IGTV vs Youtube though. The big difference is needing to shoot in portrait mode for IGTV, which makes it more difficult to post the same video on other platforms. But since more of my audience is already on IG, I'm thinking that the videos will reach more people than YouTube. We'll see! At any rate, here's the recipe! *Increase butter by a tablespoon for every 3 eggs added. Special Equipment: This section contains affiliate links. Whisk , nonstick 8" to 10" skillet , silicone spatula . Crack the eggs into a large bowl. Go ahead and preheat your skillet now, over medium low to medium heat. Since every stove is different it may take you a few tries to find the sweet spot. Using a fork or wire whisk, whisk the eggs for a minute until they are blended and just starting to look frothy. Whisking too long can create tougher scrambled eggs. Just try to avoid having any streaks of the whites left, because they'll show up in the finished scramble. Add two tablespoons of butter to the skillet; it should immediately melt and begin to sizzle. It shouldn't turn brown or burn, which would be a sign that your heat was too high. 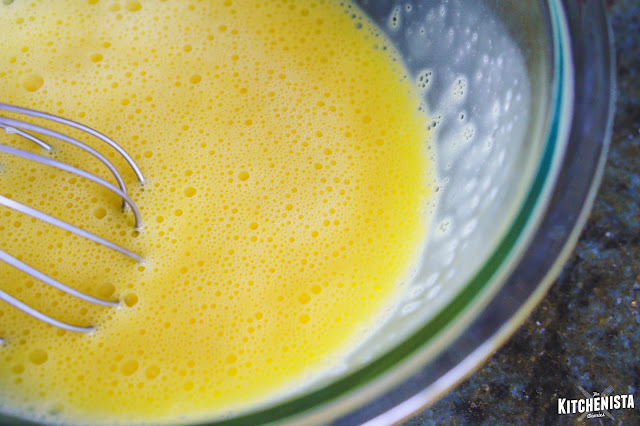 Pour in the whisked eggs. Watch for the edges of the pan, where you'll see the eggs start to set first. This usually takes about thirty seconds to a minute, depending on your heat and how many eggs you're cooking at once. Once you start to see the cooked edges turn opaque, start using your spatula to push the outer eggs towards the center of the skillet. Every few seconds as the eggs set up again, push them towards the center. 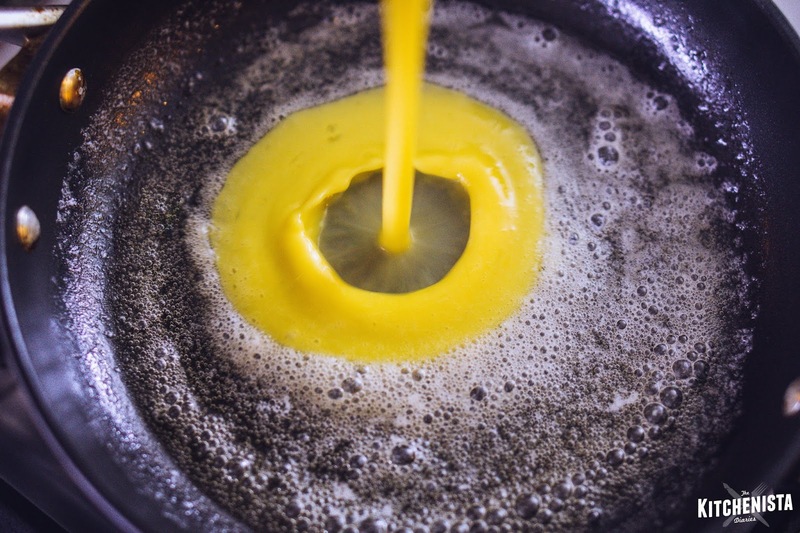 This helps to keep the cooked eggs from overcooking while allowing the raw egg to flow back onto the skillet's surface. 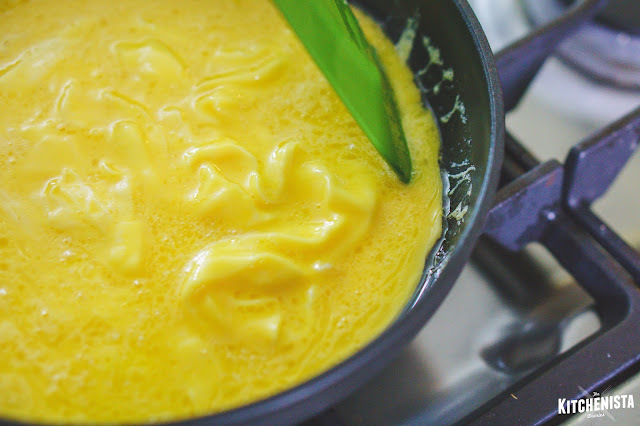 Work around the skillet in a circle, continuing to push the eggs towards the center as you go. Every minute or so, stir the eggs in the center as well. For six eggs, they'll be mostly cooked within a matter of a couple minutes. It may take longer with more eggs in the pan. When the eggs are still very wet but starting to turn opaque, season with a pinch of good salt. At this point, you could add a quick melting shredded cheese or grated parm if you wanted to. 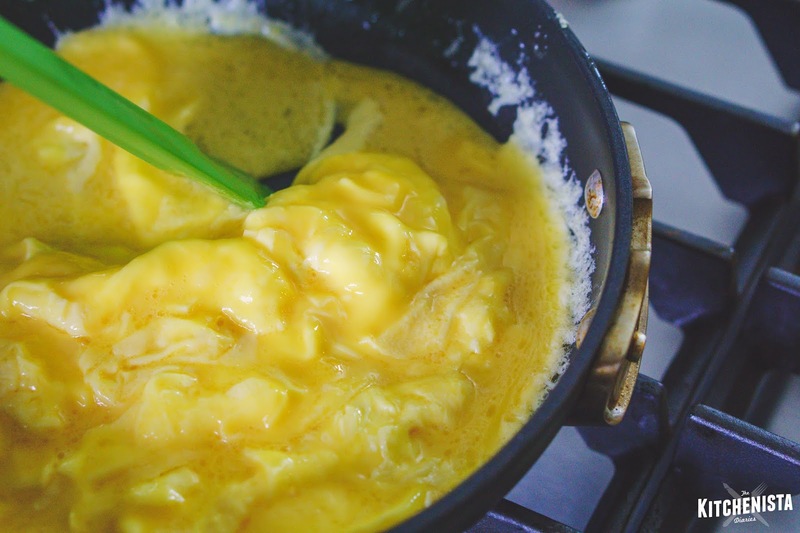 Once the eggs are mostly set, turn off the burner and let the residual heat finish cooking them off gently. If you have an electric stove, you may want to take the skillet off the burner completely. Electric stoves take longer to cool down (and heat up) than gas, so you'd run the risk of the eggs overcooking even though you turned the heat off. Cauliflower was not very high on my list of foods I was excited to eat as a kid. Like the fate of most veggies back then, it was either steamed to death or served raw and unseasoned on sad crudité platters. (I also hated celery and ranch dressing, so this was more culinary offenses than I was willing to tolerate all at once.) 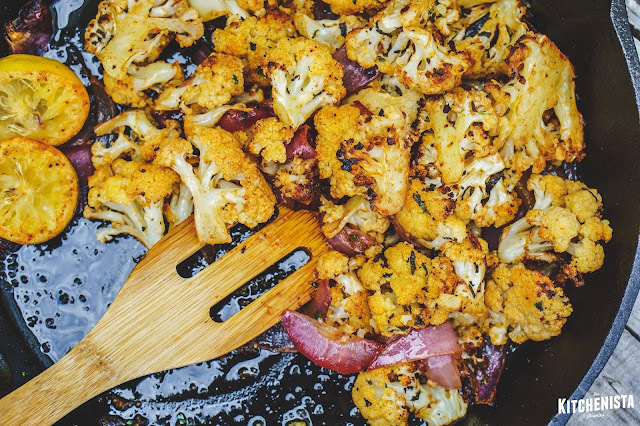 I don't remember when roasted cauliflower became the new wave, but it changed my perspective and inspired me to incorporate more cauliflower into my menus. 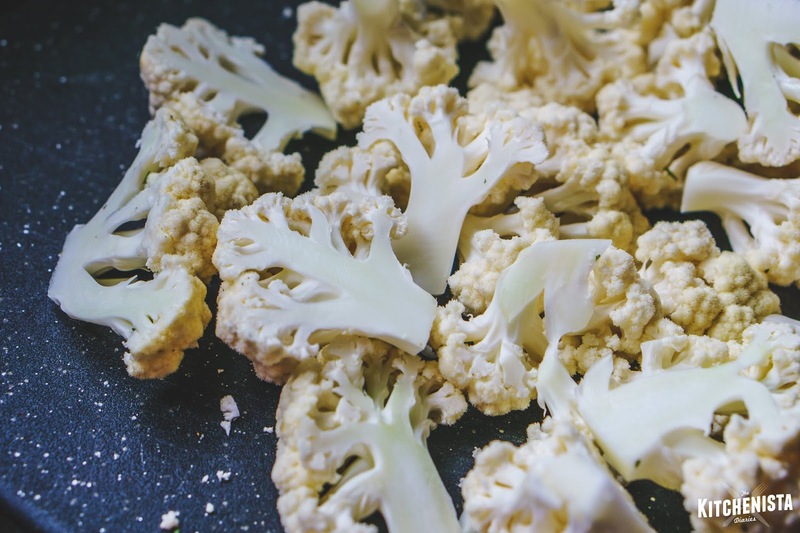 Once I learned to appreciate cauliflower for the blank slate that it is, I was more willing to experiment with other ways to cook with it. It's been especially useful as a low-carb alternative to mashed potatoes, pureed for dairy-free sauces, and riced for a grain-free component in salads or stir fries. But my go-to is roasted cauliflower. The crisp tender florets, with their caramelized edges and charred bits, are an easy side dish to make no matter what kind of diet you're on. I like using my cast iron skillet to roast smaller batches of veggies because it retains heat so well. The key to roasting veggies is dry, high heat, so that they brown faster than they start to soften. 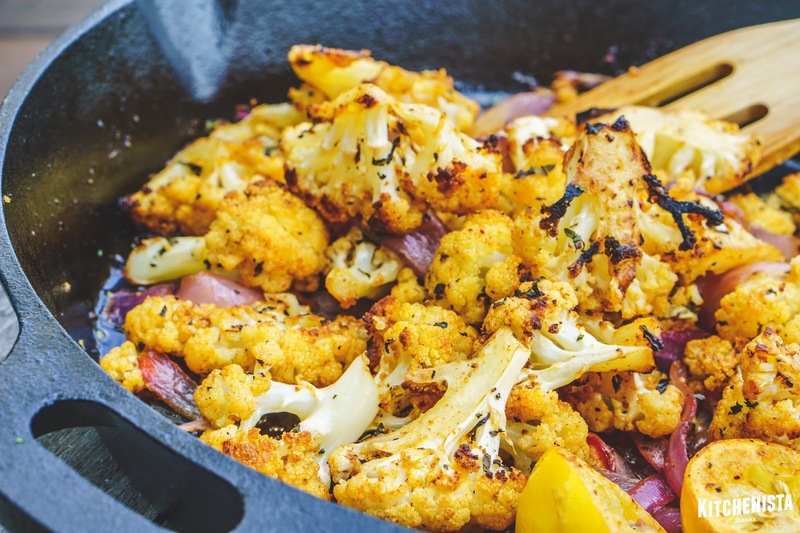 A pre-heated heavy duty sheet pan works just as well if you'd like to cook more than one head of cauliflower at a time, as I'll explain in the steps below. 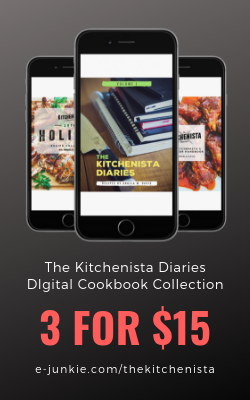 If you've got my latest cookbook, The Kitchenista Diaries Volume 1, the process will remind you of the Duck Fat Roasted Broccoli recipe. Feel free to adjust spices and herbs to your tastes; the technique will be the same with any flavor profile! As written, the recipe is vegan. Any type of cooking oil that works well in high heat can be subbed in for the coconut oil. If you'd like to make this a full meal in the same skillet, stick to proteins that will roast in the same amount of time, or stagger the cooking process. I think this would be really great with shell-on shrimp added at the very end, similar to my Cajun Butter Shrimp & Potatoes recipe! Speaking of vegan meals, I was excited to be a guest on the Forked Up podcast by Thug Kitchen last week! I've followed Matt and Michelle from my early days on Twitter so it was awesome to finally chat, vent, and laugh about this crazy internet food journey we've all been on. 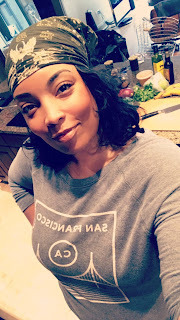 You can check out the episode here, then grab some dope vegan recipes from the Thug Kitchen blog or cookbooks! Special Equipment: Large cast iron skillet , heavy duty sheet pan or other heavy bottomed pan, grater or zester . Pull off the leaves on the cauliflower head. Using a sharp chef's knife, slice around the bottom of the cauliflower head to remove the stem. Cut the florets off in sections. I try to cut larger florets in half, to create lots of flat surface area that will touch the hot pan. In a large container or bowl, pour in a couple tablespoons of coconut oil. (If your home is cool you may need to melt the oil first. This isn't a problem for me in the summer!) Stir in the salt, smoked paprika, cumin, and black pepper to make a paste. Use your grater to zest the lemon rind into the bowl as well, then slice the lemon in half and set aside. Take all that chopped cauliflower and toss with the seasoned oil so that it's evenly coated. Stir in the chopped onions. Meanwhile, preheat your oven to 450°F. 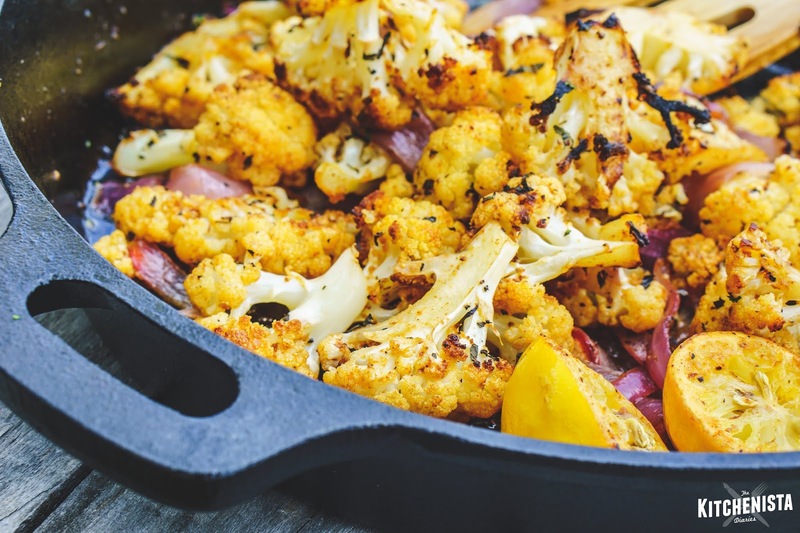 Set your cast iron skillet or heavy duty sheet pan on the middle rack so that it gets smoking hot while the oven preheats. When the oven is ready, it's safest to use pot holders and pull the skillet out temporarily, setting it on your stove top. Just work quickly so that the pan doesn't cool. Carefully dump out the seasoned veggies into the hot skillet. It should be hot enough that the pan sizzles; this starts the cooking process immediately. Add the halved lemons to the skillet; I started mine cut side up so that all the juices didn't seep out. Return the skillet to the preheated oven. 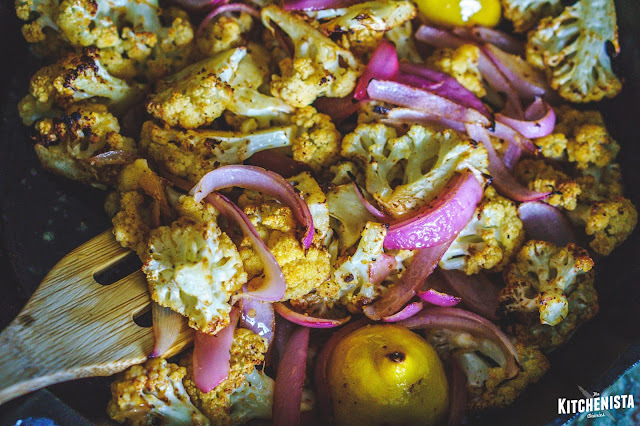 Roast for 20 minutes, or until the onions have softened and the edges of the cauliflower have started to brown. 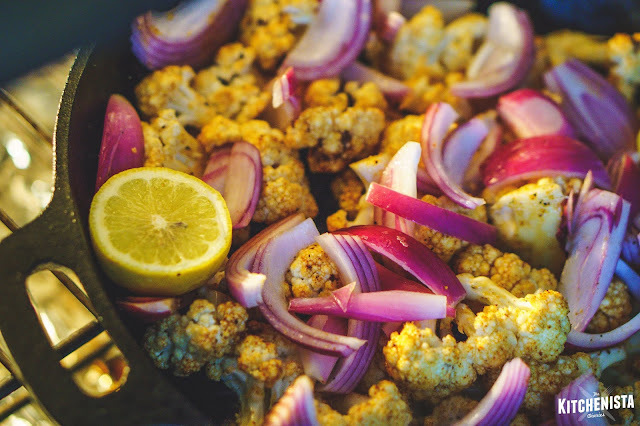 Remove the skillet from the oven, give the cauliflower a quick stir and then return it back to the oven. Roast for another 10 minutes, or until the cauliflower has browned and charred to your liking. It should be tender but still have some life left to it, unless your preference is to cook it to a softer texture. 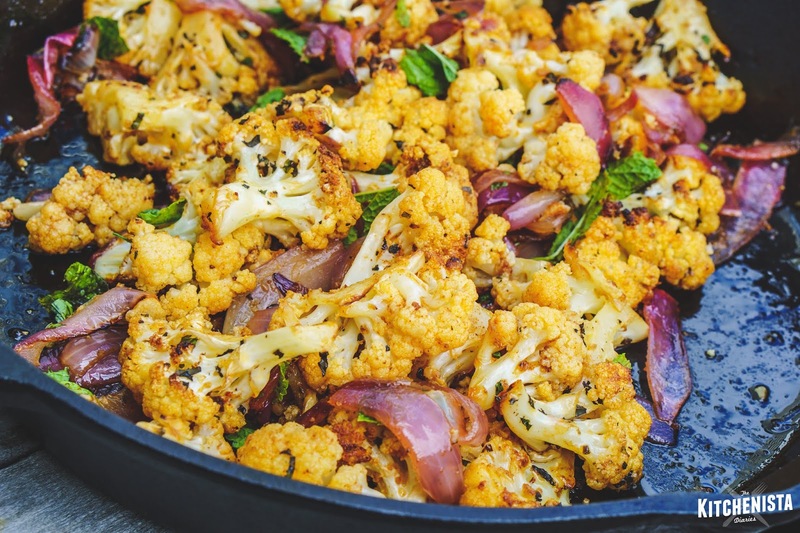 To finish the cauliflower, squeeze the roasted lemon juice over it and stir in the chopped mint. Taste a bite to check for salt; adjust if needed. 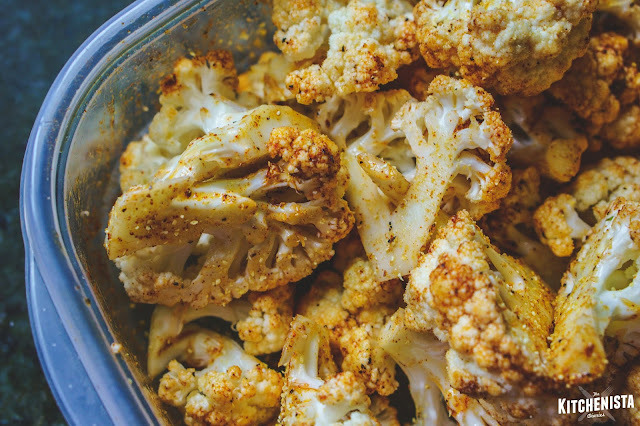 Note: If you're prepping cauliflower ahead for meals later in the week, it's best to pull it from the oven when it's just shy of being tender. It won't be as caramelized, but you'll avoid soggy vegetables when reheated.